A relatively new company, Moov Modular supports Peninsula Villages values in making a conscious effort towards using innovative products and materials, along with using greener resources and energy for its future developments to ensure minimal impact to the environment. "This partnership not only fulfils our commitment for creating a more sustainable future here at the Village, but also supports our dedication to working with the local community to achieve our goals and support other local businesses," explained CEO Shane Neaves. This week, the new staff area was dropped into the site with a fully fitted bathroom, changing room, kitchen and common area, deck and landscaped garden. These new facilities for staff will offer a holistic retreat for the Peninsula Village team who consists of more than 300 local people working across care, food services, training, leisure and lifestyle. "Moov Modular make their own Sip panels for these sustainable structures, using magnesium oxide a by-product of steel and coal, which creates a fire and water resistant material, this material doesn’t break down. These modular structures are insulated and have a low running cost. They also come with solar and the bathrooms are their own and specially designed for wheelchair access" said Shane. Moov Modular was introduced to the organisation by Directors Wayne Dowdle and Geoff Melville. Just six months old, the organisation was established by Peninsula locals Ian Munday and Tom Leudecke with a goal of making the most of local resources to create high end yet affordable structures. "With many developments and refurbished projects in the pipeline at Peninsula Villages, this is the first step of what promises to be a blossoming partnership between the two parties, with Moov Modular set to build and install a number of homes on the Peninsula Village site in the future," added Shane. Click here to view the Facebook page to view all photos from the Moov Modular installation. 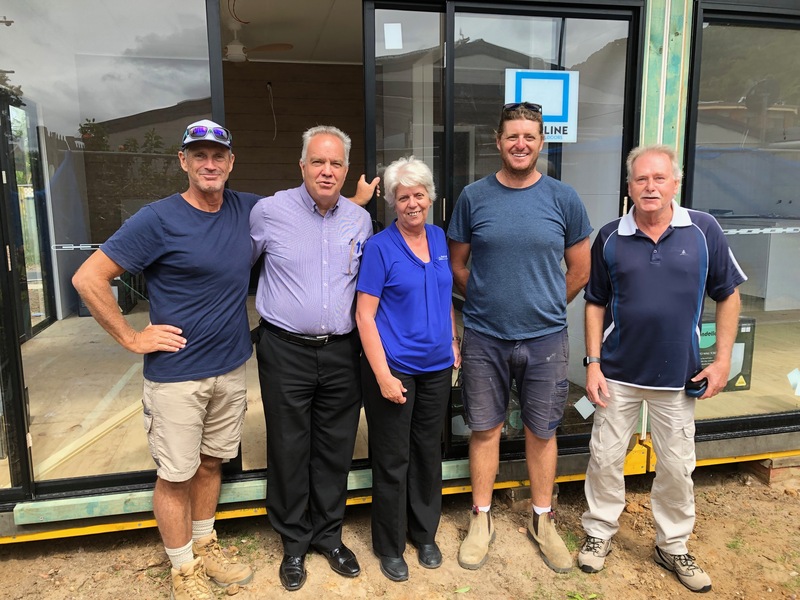 Image - Tom and Ian from Moov Modular with Peninsula Villages CEO Shane Neaves, Executive Operations Manager Jackie Bennett and Honorary Director Wayne Dowdle.